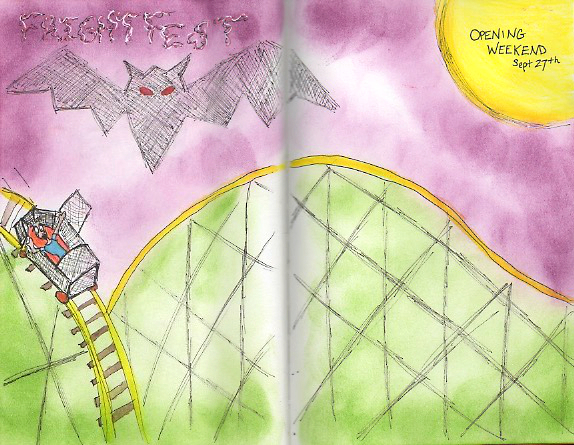 I had not visited Fright Fest at Great America in Gurnee, IL for a number of years until grand opening weekend last year. At that time, I rediscovered how much I love visiting the park during the fall season. No heat, no bugs, just plain fun. Crisp autumn air and frights where everywhere to be found. Greeting us at the park entrance is only of my favorite things to see; Fright Fest’s Pumpkin King in all his frightful glory as he introduces us to the haunts in the park. Little did we know that this would be the Pumpkin King’s last year at the entrance and has been since moved to the haunted ride cemetery. Other attractions include spooktacular characters that fill the park at dusk as they parade around Hometown Square looking to scare unsuspecting visitors. We even witnessed visitors asking characters to partake selfie’s. My husband and I jumped on board the selfie band wagon by asking a zombie to take a picture with us!